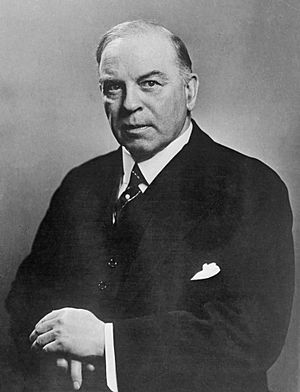 William Lyon Mackenzie King, PC, OM, CMG (December 17, 1874 – July 22, 1950), also commonly known as Mackenzie King, was the dominant Canadian political leader from the 1920s through the 1940s. He served as the tenth Prime Minister of Canada from December 29, 1921 to June 28, 1926; from September 25, 1926 to August 7, 1930; and from October 23, 1935 to November 15, 1948. A Liberal with 22 years in office, he was the longest-serving Prime Minister in Canadian history. King died on July 22, 1950, at Kingsmere from pneumonia, aged 75. He is buried in Mount Pleasant Cemetery, Toronto. Signing of the Dominion–Provincial Agreement on Old Age Pensions in 1928. (Seated, L–R): Peter Heenan, Thomas Donnelly, John Millar, W. R. Motherwell, William Lyon Mackenzie King, C. A. Dunning. (Standing, L–R): Fred Johnson, John Vallance, Ed Young, C. R. McIntosh, Robert McKenzie, Gordon Ross, A. F. Totzke, George McPhee, Malcolm McLean, William Bock. 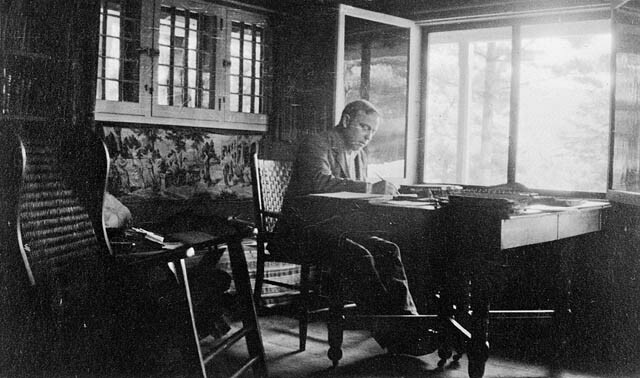 William Lyon Mackenzie King Facts for Kids. Kiddle Encyclopedia.